Andrew Rannells is one busy guy—in addition to playing Hannah’s pal Elijah on HBO’s Girls, he’s also gearing up to star in Hedwig and the Angry Inch while filming the new movie The Intern at the same time. But the Tony nominee still somehow found the time to see the toe-tapping musical Bullets Over Broadway with his Girls co-star Allison Williams on July 26. 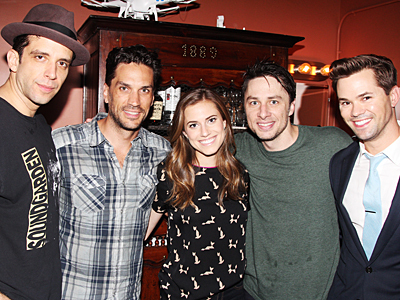 The duo wasn’t the only star to catch the show that night—Will Swenson, who is prepping to star in Bull Durham in Atlanta, GA, was also on hand to see Zach Braff, Nick Cordero and the tap-dancing gangsters in action. Check out these Hot Shots of the star-studded evening, then see Bullets Over Broadway through August 24 at the St. James Theatre.